Roads have been laid several time over the past decades and eventually rose above the level of old houses, making them look as if they had sank into the ground. Old time residents of Dharavi in central Mumbai, are fond of reminding those who dream of a concretized neighbourhood that it was thanks to their efforts that the place got a semblance of being inhabitable to start with. It was on some swampy, marshy, mosquito infested space at the edge of the city – squeezed between mangroves, the coastline, a tributary and some old villages – that small, incremental acts of land reclamation, over decades, produced a sense of terra firma- to create what would become prime real estate decades later. 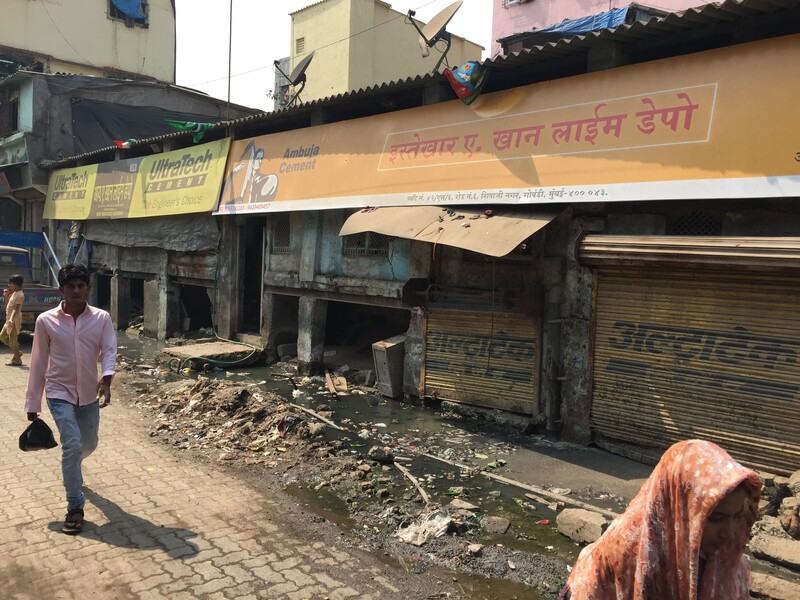 Something similar lies below the thousands of homes that make up Shivaji Nagar in Govandi, further up, northeast of Dharavi in Mumbai. Physical space for this planned resettlement colony was created through decades of dumping the city’s garbage – an activity that still continues - to create a mountain of waste that lines the horizon. The garbage itself was piled over wet-lands making for a water table so high that what we in fact get at the end of the day – is a floating neighbourhood of sorts. As URBZ has involved itself in local construction projects over the last couple of years, it immersed itself quite literally in the stuff that lies beneath, that makes up the foundations of all construction activity. 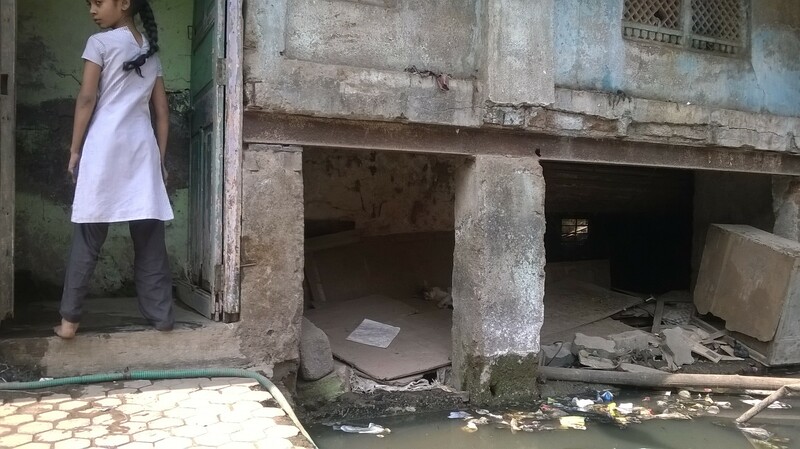 This is a report prepared by Jai Bhadgaonkar and Giovanni Rapanna about how people in Shivaji Nagar manage to build homes that stand above a liquid underground. Shivaji Nagar is located next to one of the largest dumping grounds in Asia and settles upon a preexisting swampland. The initial settlers had built temporary structures, which, over the years started to stabilize with pucca (strong, stable brick and cement) ones being built in time. Some of the older houses here have deep foundations. But over the years, as the marshland got reclaimed and infrastructure like roads and pathways started to be built, the terrain became increasingly uneven. The new facilities kept increasing in height of the ground to a point where plinths of old houses went below the road levels. This process of land-filling also resulted in an unstable soil for construction activities in the neighborhood, requiring considerable innovation in foundation design – that would have to keep in mind the stability and cost efficiency of building new structures. 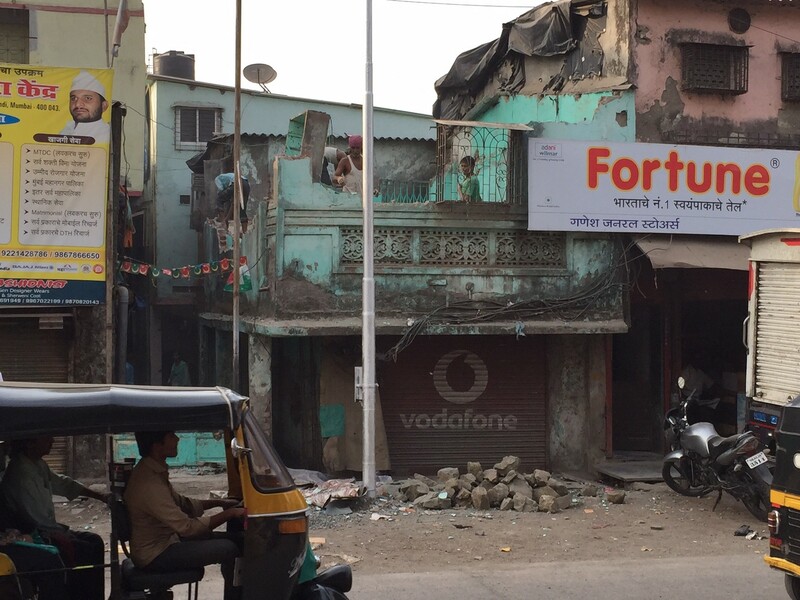 In Shivaji Nagar, there is a particular history of layering of the subsurface on the ground. Originally the top layer of surface was swampland and soft soil. Over a period of time layers of trash and debris got compressed through habitation. The Municipal Corporation placed a harder layer of debris or stones, bricks and other materials to create a segment on top of the surface, which started to act as the ground. However this subsurface is still constituted by soft and unstable material, thanks to the high water table in the area, making for unstable foundations. In the houses that were constructed around 25 years back, the plinth was raised by 3ft from the ground level, with a floor height of 12ft above that. The foundation was then dug up to a depth of 3ft below ground level. Over a period of time the road levels increased due to periodic landfill. But unfortunately the material that was used for landfill continued to be garbage waste. The ground level simultaneously rose by 9ft over the years. Considering this difference in the old and new ground levels, the new constructions started to dig down to 10 – 12 ft. of foundations to reach the hard strata. That is because of the presence of the soft garbage waste in the top 9 ft. layer. This made it an expensive process and out of bounds for most who live here. 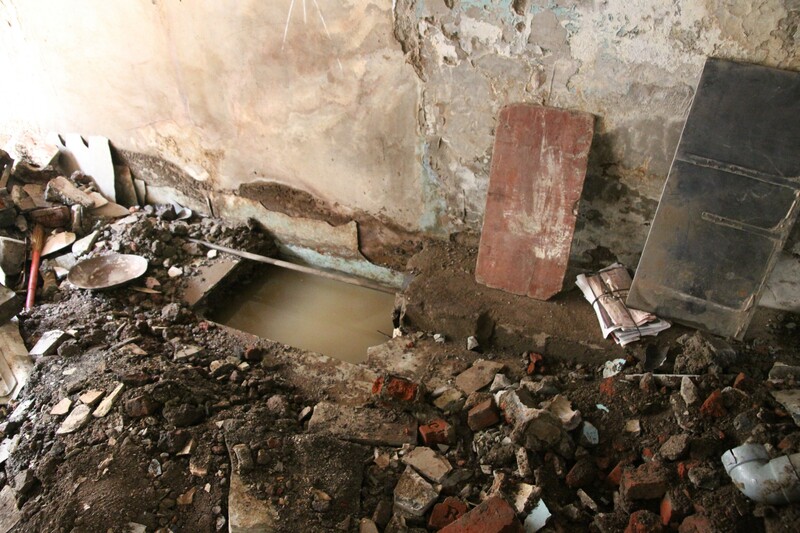 As a cost effective solution to this problem, the local contractors started to build the foundation only 2 ft. (or less) deep from the existing ground level, burrowing through the debris without touching the garbage fill. This gives the house enough stability to stand and – to some extent – reduces sinking thanks to the support from the garbage below. The plinth beam and reinforced cement concrete (RCC) plinth slab (which is usually just plain cement concrete (PCC)) thus acts as an anchor of sorts. This method is very commonly adopted all over Shivaji Nagar. However, residents of the area often demand deeper foundations, which they see as the norm in other neighbourhoods and pressure contractors to eventually go down 2’6” deep sometimes. With the foundation being in such a state, the deeper you dig, the more you get soft unstable peat material. However like elsewhere, the deeper you go there will eventually be solid ground on which piles can rest. That may mean going 15 feet down or deeper. This though will cost the contractor money and in turn the client won’t be able to afford what is seen as luxury. An alternate solution commonly used by contractors is to dig deep down the hard layer, but not so deep that it will enter the soft soil and cause the structure to sink. A very fine balance has to be maintained indeed. In many ways the unstable foundations combined with insecure tenure that these homegrown neighbourhoods have learned to live with, are markers to other fluid presences in their lives – a malleable, unsure bureaucracy and some very weakly formulated policies. What remains stable though is the ingeniousness of the contractors and willingness of the residents to somehow make something solid – even if floating - out of thin air.